Yes that’s right, he has the ability to go FORWARD now. He’s been able to push himself back in his car for sometime, but going forward hasn’t been as easy. A big reason this is possible is that he’s able to straddle this car and sit up by himself for so long. Pretty cool–it’d be a shame to have such a nifty car that makes all those noises and not be able to go places. Rudy’s doing well with the speaking valve in all day. He’s needed a break a few times where he got tired and we needed to take it off. We generally are finding that we need to give him a bit more oxygen flow to keep his sats where we like them. He babbles a good bit, but has long quiet stretches where he just takes it all in and quietly contemplates things. Livy woke up bewildered from the flash and Rudy saw that as a window to make like a bed hog. Previous Post It Might Get Loud! YAY Rudaaaaayyy, with PT and Forward propulsion!! Get that little car going Vrrooom, vrooommmm. WE ar so proud of you, sweet boy. Rudy… YOU are AWESOME!! You are becoming such a big boy. Beyond awesome! And too cute! Driving with the tunes blaring! Way to go, and what a sweet picture with sister. Way to go Rudy! So much more fun when you can get around where you want to go. Love the sleep over with Livy pix. Hugs and prayers as always!! Beyond words cute, lovely, winsome and wonderful. 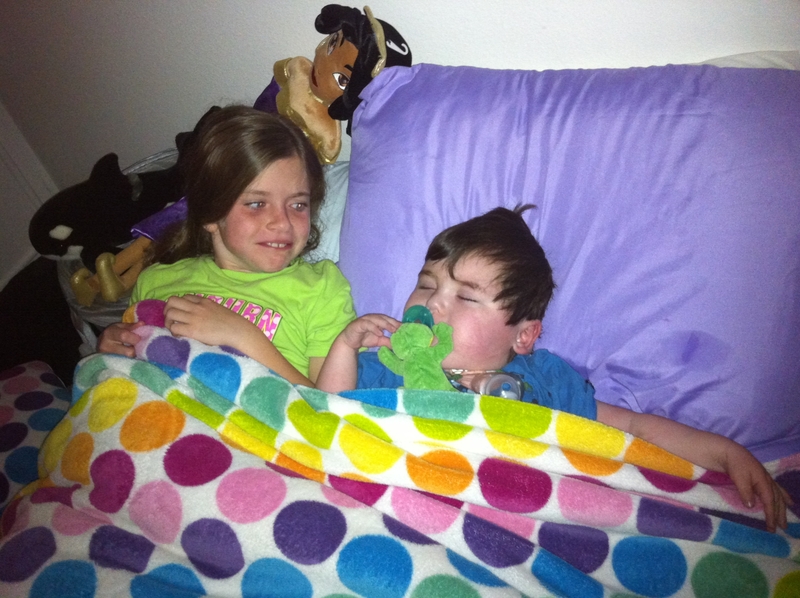 Thanks so much for this post – so great to see ‘our’ boy making such marvelous forward progress. :>) And the big sister pix – fab. Love to you all..
Rudy, you are learning new things all the time. Won’t the household be happy when you learn to switch on all the noise makers on your truck! Good exercise on that truck. It amazes me you can be so active with that little half heart keeping up. Great! I am proud of all of you. What precious moments to remember. Blessings! So cute! Love their slumber party. Great news about P.T. 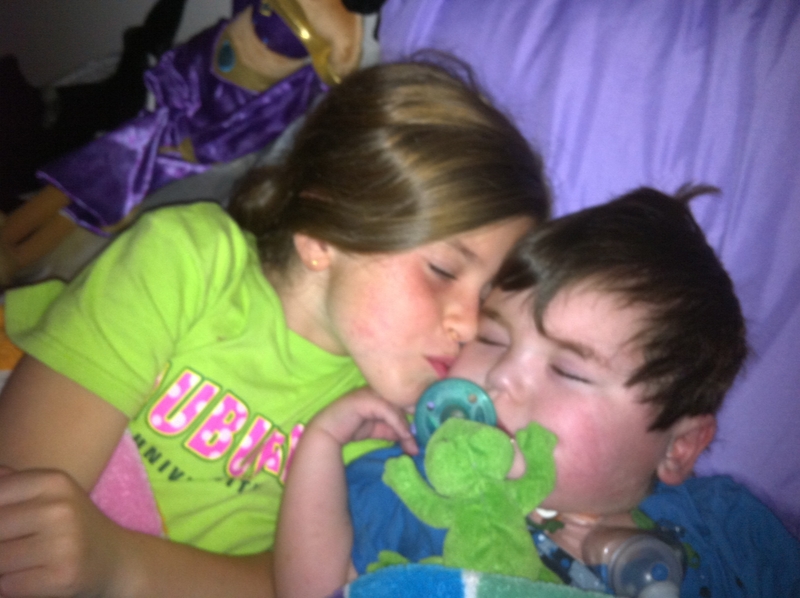 I continue to pray for little Rudy and his family every night, as soon as my head hits the pillow. You all amaze me. He looks so proud of himself moving his car forward…and the clapping he does at the end…SO cute! He’s so adorable! 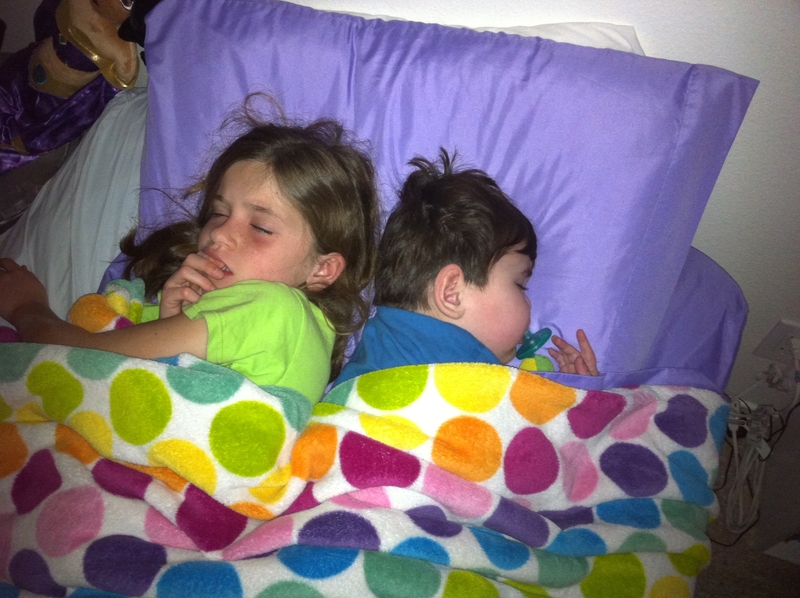 And I love the photos of him in Olivia’s bed all snug with big sister. Ah, great moments in this journey. We celebrate with you and keep you in our prayers! Yeah Rudy! Progress is great! And adorable pix with Livy!!! yeah! See Rudy go! Kisses to all!